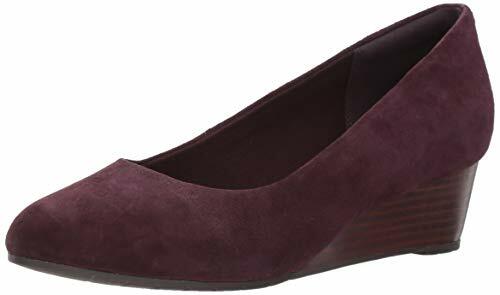 CLARKS Women's Vendra Bloom Wedge Pump, Vendra Bloom Aubergine Suede, 7 M US | What Should I Say? A classic women's dress shoe that's so comfortable, you'll want it in every color. the vendra bloom, crafted in premium uppers is a beautiful wedge heel from the clarks® artisan collection. cushion plus™ with a comfy molded ortholite® footbed and durable rubber outsole keep feet comfortable. this versatile style looks fab with everything in your closet - from casual skirts to perfectly pressed pants.